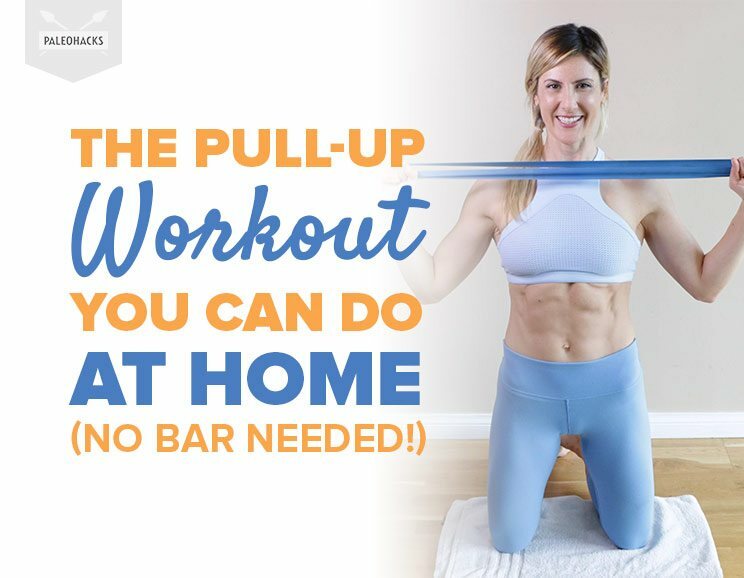 All you need is a stretch band, a door, and a towel for this bar-free pull-up workout you can do at home! Pull-ups are the ultimate challenging bodyweight exercise. If your goal is to get strong enough to do a pull-up, then you’re going to love this workout. 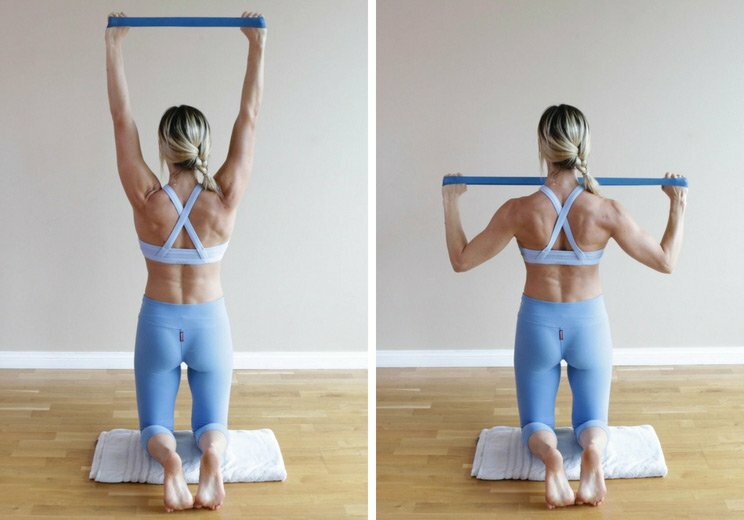 I’ve put together a circuit training workout you can do at home (or anywhere) that does not require a pull-up bar and helps you strengthen the muscles needed to do a pull-up. Follow this workout a couple times a week and eventually, you’ll feel strong enough to tackle the real thing. Follow each of the exercises in a circuit until you’ve completed one round of all 10 of the exercises. Allow only as much rest as needed between exercises. After you’ve completed one full round of the circuit, take a 2-minute rest break, then repeat the circuit one or two more times depending on your fitness level. I recommend following this workout at least 3x per week to get strong enough to do pull-ups. Space your workouts 1-2 days apart. For example, follow this routine on Monday, Wednesday, and Friday so that you’re taking at least one or two days of rest between each workout (no consecutive days). As you get stronger, you can progress by using a stronger resistance band, doing more reps, and/or doing more rounds of the circuit. Continue strengthening your back muscles and you’ll be ready for pull-ups in no time! Sit down on the ground and extend your legs out in front of you with your feet flexed. Loop your resistance band around both feet. Sit up tall with your back straight and your abs tight. Grab onto the middle of the band firmly with one hand, palm facing down. Place your other hand on your hip. Pull the band towards your ribs as you pull your shoulder blade onto your back and flex. Exhale with each pull and inhale as you release back to the starting position. Continue 10 reps on that side, then switch hands and complete the same number of reps on the other side. Tip: Do not allow your torso to twist. Maintain your straight and forward facing posture as you pull and release. Stand on your resistance band with your feet about shoulder-width apart. Grab onto the band with your hands about shoulder-width apart. Hinge at the hips to bend forward with a straight back (your back should not be rounded). Look down at the ground to keep your head in a neutral position. Pull the stretch band up towards your ribs and guide your elbows towards each other behind your back. Exhale with the flex, then inhale as you lower the band down again until your arms are straight. Repeat lifting and lowering while focusing on your back muscles. Tip: You can adjust the resistance by standing with your feet wider or closer together. Kneel on your towel to cushion your knees. Grab onto the ends of your resistance band and clasp your fingers around to secure your grip. Reach your arms straight up above your head and stretch the band apart just enough to feel some tension. Keep your left arm perfectly straight as you pull down with the right arm. Form half of a “W” shape by keeping your elbow back and away from your body. Flex your back muscles on the right side as you exhale, then inhale and rise up again. Next, pull down with your left arm while you keep the right arm straight and tight. Continue alternating sides to complete 20 reps per side. Tip: Focus equally on your straight arm and your pulling arm. Try this move in front of a mirror to ensure your form is good. Lie belly down on your towel and grab tightly onto your resistance band with both hands. Lift your arms straight out in front of you in a Superman position and pull the stretch band tight. Exhale as you bend your elbows to pull the band towards your collarbone. Pull your shoulder blades together as you flex your back and keep your elbows out wide to the sides. Inhale to lengthen back out to the Superman position. Complete 10 reps, staying raised up for the whole set. Tip: If this feels too challenging, let go of the band and do a simulated version instead. You can also prop yourself up with a pillow under your belly to make it less challenging (you won’t have to use as much muscle power to lift your chest off the ground). Sit down on the ground and extend your legs out in front of your with your feet flexed. Loop your resistance band around your feet. Grab onto the band firmly with both hands, palms facing down. Exhale to pull the band towards your ribs as you pull your shoulder blades together. Inhale as you release back to the starting position. Complete 10 reps, keeping your back muscles flexed. Fold a towel so that it matches the size of your torso, from chest to knees. Lie on top of it belly down, bend your knees and cross your feet in the air. Reach your arms out in front of you and place your palms firmly on the ground wider than shoulder width. Exhale as you engage your back muscles and pull yourself forward until your shoulders reach the height of your hands. Inhale to push yourself back to the starting position. Continue to pull forward and push back to complete 6 reps. This movement requires a smooth floor surface. If the floor is not smooth enough, there may be too much friction to perform this exercise. Keep your hands slightly damp to get the best grip. If your hands are slipping, try wetting your hands, pat them gently with a towel, and try again. You can also try putting a yoga mat underneath your hands for a better grip. If you struggle to pull yourself forward, try using your toes on the ground to assist. Take mini steps with your toes to help you pull all the way forward. Exhale to pull the band down towards your collarbone so that your arms form a “W” shape. Inhale to raise your arms back up to the starting position. Tip: You can also do these seated or standing if the kneeling position is uncomfortable for you. Start by standing on your resistance band with both feet. Grab onto the middle of the band with your right hand and rest the left hand on your knee. Hinge at the hips and straighten your spine (your back should not be rounded). Maintain a slight bend in your knees and look down at the ground to keep your head in a neutral position. Exhale to flex your back and pull the band up towards your ribs on the right side. Resist any rotation. Maintain your gaze straight down at the ground. Complete 10 reps on the right side, then switch and complete 10 reps on the left side. 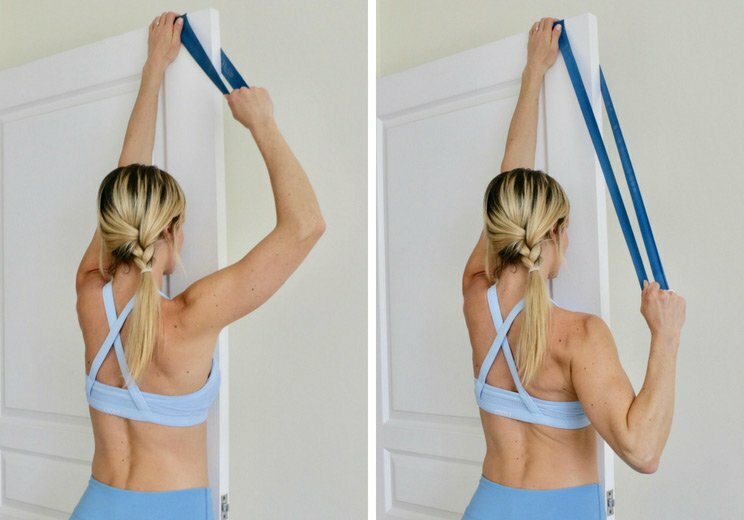 Loop your resistance band over the top corner of a standard door. Hold the band in place with your left arm and secure your grip with your right hand. Exhale to pull your right elbow down and back, flexing the back muscles on your right side. Inhale and relax your arm to raise it back up just enough to feel the tension release. Once you’ve completed 10 reps on the right, walk around to the other side of the door, face the other direction and complete 10 reps on the left. Tip: Depending on your height and the length of your stretch band, you may need to bend your knees a bit or even stand on a step stool to adjust the resistance. Stand beside an open door and loop your stretch band around the top corner. Take a shoulder width grip on the band. Keep your feet on either side of the door to prevent it from swinging. With about 3 inches between your chest and the door’s edge, exhale to pull the stretch band down towards your collarbone. Your hands should come down to the tops of your shoulders. Inhale as you raise your arms back up. Tip: Keep just a bit of tension on the band at all times. Depending on your height and the length of your stretch band, you may need to bend your knees a bit or even stand on a step stool to get the resistance right.